Vous souhaitez poser une question à l'établissement Korat Resort Hotel ? Parfait pour le plaisir et la détente, le Korat Resort Hotel se trouve dans le quartier de Chok Chai à Nakhon Ratchasima. L'hôtel se trouve à 20.0 km du centre-ville et permet d'accéder aux infrastructures urbaines les plus importantes. Avec les principaux sites de la ville, dont Chok Chai Hospital, Zoo de Nakhonratchasima, à proximité de l'établissement, les clients vont adorer cet emplacement. Profitez d'une multiplicité de services et d'équipements incomparables dans cet établissement de Nakhon Ratchasima. L'établissement donne accès à un vaste éventail de services, dont WiFi dans les espaces communs, parking, service en chambre, restaurant, blanchisserie, pour n'en citer que quelques-uns. 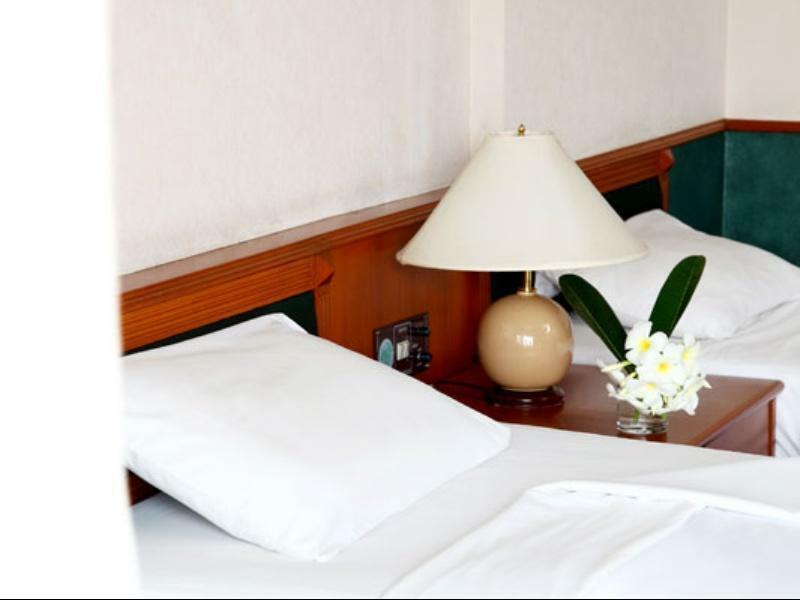 L'atmosphère du Korat Resort Hotel se retrouve dans toutes les chambres, et climatisation, service de réveil par téléphone, bureau, mini-bar, balcon/terrasse ne sont que quelques-uns des équipements disponibles à travers l'établissement. Grâce au vaste éventail de loisirs proposé par l'hôtel, les hôtes ne manqueront pas d'activités durant leur séjour. Le Korat Resort Hotel, où les séjours sont immanquablement agréables et dépourvus de tout souci, est un excellent choix à Nakhon Ratchasima. Veuillez noter que des frais de 200 THB s'appliquent pour les demandes de lits pour bébé. L'hôtel est situé loin du centre-ville. Il faut être véhiculé pour profiter de la région. Sinon, l'hôtel est sympa, avec une piscine pour les enfants. Les chambre sont propres et le personnel est à la disposition. Dommage, il ne parle pas bien anglais. Voici plusieurs années que nous fréquentons cette hôtel, ils viennent de commencer la rénovation des chambres car un peu vielles. La piscine est très grande (un peu sale), salle fitness à l'ancienne, sauna, chambre spacieuse (deluxe énorme),restaurant un peu cher mais au bord d'un étang, practice de golf, ballade dans le parc. L'hôtel est éloigné de la ville, il vaut mieux un moyen de locomotion. The major two advantages of this hotel are the beautiful and quiet country setting location and the large swimming pool. The rooms are OK although the bathtub/shower is extremely slippery and great care has to be taken not to fall. It seems that hotelrooms with bathtubs are really a thing of the past and a walk-in shower is much more efficient (and safe) in terms of time and water wastage. During our visit we were virtually the only guests but hotel can be busy when seminars are being held. Breakfast simple but adequate. There is a decent restaurant adjacent to the hotel with some live music in the evening. We definitely plan to return here. Because we have a little baby with us, It would be more convenient to have a kettle in the room as we need boiled water to make milk. However, hotel staff provided one for us right away when being asked, they were very nice. Hair Dryer should also be included in the room. Anyway overall staffs and facilities are mostly excellence, we'll go back!! We really enjoyed our time at this resort. Our 2 year old loved the kids pool, which was rather big. The grounds were nicely landscaped, and the staff friendly. We will always stay here if we want to bring friends to show them the zoo. We stayed two nights at the Korat Resort Hotel: the room is very spacious - we could fit extra beds for our boys in the standard room. We could have had two connecting rooms (superior+standard) for approx the same price, but these were on different hotel wing which didn't appear to have been renovated (old carpeted floors) like the simply standard ones (laminate flooring), so we went for the newer looking standard room. The hotel is a bit old and the breakfast very basic, but the grounds and hotel set up are truly beautiful. The nearby Zoo is beautifully kept, the boys truly enjoyed. You can hire bikes and there is also a separate area with a swimming pool and slides. the hotel was the only option in the area as we were traveling on business. last time we stayed here we were put in the carpet room and it was horrible. the smell was old and moldy. but this time we stayed in the wood flooor rooms which i think were newly renovated. it was much better. the bathroom was not that clean but it was okay for an old hotel. the hot water was either wayyyyy toooo hot or too cold. i couldnt take a proper shower without burning myself. the breakfast was good. if you stay there while there are many guests there will be a buffet but if not then you get a set menu. the check in and chek out service was quite fast and the staff were friendly. the restaurant was so overpriced and the food was just okay. there are no convenience stores nearby the hotel so stock up on water and snacks or amenities (not provided at hotel except towels) the nearest "minimart" is 10 kms away. the check in process was fast. the rooms were spacious but old. the carpet needs cleaning or removal altogether. staff was okay and breakfast was included. the bathrooms were not very clean but it was still acceptable. everything was really quiet and the only place to eat was at the restaurant in the hotel. Its out of the way without your own transportation. But, its just a great place to take a break and relax with a great pool and small but useful fitness gym. Sits on Hyw 2513 down the road from the Korat Zoo. You can drive into the heart of Korat in a matter of minutes. The staff is NOT proficient in English but they will work with you in getting the message across. Very nice garden and very big and nice swimmingpool. The staaf was very friendly. Large room and good food at the restaurant close to the small see. Normal american breakfast served by very nice people. Driving range close by if you play golf. 20 minutes to Korat golf and country club. Although the hotel has seen its heydays it has been kept in very good condition and the rooms are very clean. The layout of the hotel is generous and the rooms have a good size. We changed to one twin bed room and one deluxe room with connecting doors which served us well for our family. We used the hotel as a base for sightseeing in the area and received useful and friendly information in English from the staff about fishing although they are used to Thai customers. To be flexible it is better to come by your own car. it is located out of the town, surrounding are green. We can have fresh air and calm environment during the time we stay. It is easy to find since it is just aside the highway. The golf driving range is good enough for us to play for hours but doesn't cost much.